Doc Severinsen may have not appeared on your screen since Johnny Carson turned the keys to The Tonight Show over to Jay Leno in 1992, but he hasn’t slowed down. Hired as a musician for NBC’s radio network in 1949 and, later, a familiar face on the network’s TV shows, he first appeared with The Tonight Show /i>band, led by Skitch Henderson,in 1962. In 1967, Doc became the band’s Music Director. He was notable for his bravura trumpet playing, but what got the gossips talking is what Doc wore on the air. Long before the Beatles and other musicians set the sartorial bar, Doc was a prime time dandy. You never knew what he’d wear on the air – and neither did Johnny. In the 24 years since his Tonight Show gig ended, Doc, now 89, hasn’t slowed down. He’s still got an incredible set of lungs. Plus, he’s conducted symphony orchestras around the country and toured with his San Miguel Five group and, currently, with his Big Band. His website displays 39 albums, most produced since the early ‘90s. Thursday evening, the Music Hall at Strathmore was awash in gorgeous purple, turquoise, red, and yellow lights. Turquoise and yellow panels shone high above the rear of the stage. The lower rear semi-circle was backlit by purple and red lights glowed from the ceiling several stories above. Of course, the lights couldn’t compete with Doc’s first outfit. He strode out on stage a moment after the sole female musician seated herself at the piano and fluffed her curly silver hair. Like the other musicians she wore a black business suit and shirt. The men also sported solid colored ties. Save for the drummer, most of the musicians appeared to be 30 and older. Doc didn’t need a spotlight. Holding his golden S.E. Shires Severinsen Destino III trumpet, he made his entrance in a pair of lime green leather trousers, bright purple shirt and a blue, lime and silver patterned jacket dusted with tiny rhinestones and beading. With no introduction, he and the band swung into a fast-paced, jazzy tune. Onstage with him were 12 musicians: five on saxophones, three trombones, one trumpet, one bass, one pianist/keyboardist and a drummer. They got happy performing “September Song,” sung in the 1938 musical Knockerbocker Holiday by a character performed by Walter Huston. “He was unhappy about getting older,” Doc said without a trace of irony. As Doc directed with the enthusiasm of a teenager, the band ripped into the piece, filling the hall with their polished, brassy sound. Opera singer Vanessa Thomas, in a long, sequined purple dress, was introduced and quickly captured the audience with her deep, jazzy version of “Singing in the Rain.” Her rich, low voice could bend around the notes, rising to a squeal equal to the sound of Doc’s trumpet. As the pianist’s fingers skated across the ivories, Thomas, Doc, and the Band segued into an exuberant rendition of “When You’re Smiling.” The sound threatened to spill out of the Music Hall and into the surrounding hills. The next song, “Georgia On My Mind,” was purely instrumental and a showcase for Doc’s trumpet virtuosity. Next on their playlist – which, unlike other groups is not set in advance but crafted onstage and spur-of-the-moment – was Tommy Newsome’s arrangement of Stevie Wonder’s “Isn’t She Lovely?” a jazzy version of the classic rock song. Doc’s trumpet came across clean, clear and LOUD. He was joined by band member Ernie Watts on Tenor Sax. Watts was a longtime member of The Tonight Show Band. Next up, “Jumping at the Woodside” by Count Basie. It started with a piano riff, followed by the glorious horns. After an intermission, Doc returned. This time, he was wearing his “Day of Death” outfit. Tangerine leather trousers – do you know any man over 35 who can get away with any color leather pants? Doc can. Over his fuchsia shirt was a black tuxedo jacket with a satin shawl collar and … a sequined hatchet and what appeared to be a noose on the front and on his back a skeletal figure. The Band, with bravura flourishes, performed Dizzy Gillespie’s “Night in Tunisia,” and a sensual “Ishfahan” by Duke Ellington. “We call ours the ‘Twelve O’Clock Jump!” Doc yelled, still not breaking a sweat. Doc Severinsen and The Big Band are returning to this area Thanksgiving Weekend for three performances at the Joseph Meyerhoff Symphony Hall. Want to treat yourself? Go! Doc Severinsen and Friends played on November 18, 2016 at The Music Center at Strathmore – 5301 North Tuckerman Lane, in North Bethesda, MD. For future events, go to the Strathmore’s calendar of events. Doc Severinsen and Friends will return to this area on November 25, 26 and 27, 2016 to perform at the Joseph Meyerhoff Symphony Hall – 1212 Cathedral Street, in Baltimore, MD. Tickets can be purchased online. Check out Doc Severinsen’s website. 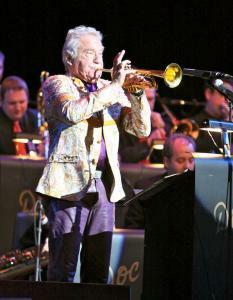 SPRINGFIELD — With Grammy Awards and a place on one of the greatest shows in television history in his past, you’d think legendary trumpet player and “The Tonight Show Starring Johnny Carson” big band leader Doc Severinsen would slow down in his golden years. Not when he can still play music “Once More With Feeling,” his show based on his bestselling recording. Severinsen and his 17-piece band will open the Springfield Arts Council’s Broadway and Beyond season at 8 p.m. Saturday, Oct. 22 at the Clark State Performing Arts Center. The show is presented by the Springfield Arts Council. A frequent performer in Springfield over the years, Severinsen, age 89, is excited to be stopping here once again. “These are the kind of people who like my music and that makes me want to come back and perform,” he said. He has an association here beyond music. A quarter horse enthusiast, Severinsen often came here to visit the late Blair Folck, who raised horses, and often enjoyed a meal with the family. “I wouldn’t be surprised to see some of the family at the show,” said Severinsen. “She’s really a fabulous singer. She comes out on stage and just takes over,” he said. Expect his usual colorful and offbeat wardrobe, which Severinsen said has become as big a part of his identity as his trumpet. He’ll begin the concert with one of the most familiar theme songs in television history, “Johnny’s Theme,” which opened “The Tonight Show” for years. Severinsen said the show was so special, because Carson had the brightest mind of anybody he knew and the band had to be paying attention. “We went to work every day with no idea what could happen,” he said, laughing. Living an active life keeps Severinsen going. He still rides horses, works out, watches what he eats, surrounds himself with friends and thinks positive thoughts. He’s even planning how his 100th birthday in 2027 will go — with friends on an all-day trail ride. Then Severinsen will likely pick up his trumpet and play. “My wife asked me about retiring, and I said ‘why,’ because it tells me who I am. My music is my way of life. 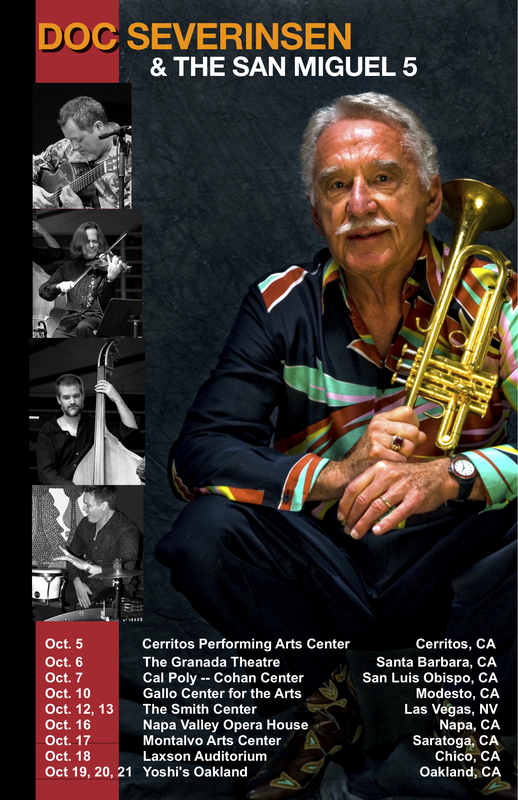 Doc Severinsen here, asking for your attention about a very important matter! Clark Terry, the great jazz icon, has had and is having a very serious challenge from a disastrous diabetic condition. Clark has been giving music lessons from the hospital in Arkansas-and when I spoke with him a few days ago-he sounded like the young man I first met when we were kids. Lighthearted, happy, courageous-you know, just like he plays his music. If you appreciate C.T. as I (and many others) always have, then it is time to step up and pay homage to one of America’s greatest musicians. Send your generous tribute to the Jazz Foundation of America*, and if you’re having a good day—-make it last forever. PS Please do me a favor, and if you do, it will make you feel better. If you’re planning on sending a dollar or two or five or ten, think about how special Clark is, and double the amount. I thank you. *Jazz Foundation of America website is www.jazzfoundation.org. Look under How You Can Help, then under Memory/Honor, fill out the form and indicate Clark Terry as the person to whom you would like to pay tribute. Contrary to some advance publicity, Doc Severinsen’s appearance Monday night at the Lied Center for Performing Arts was not a program of classical Spanish, movie music or gypsy jazz. 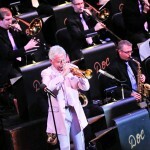 As expected from the 84-year-old trumpeter and his 16-piece big band, the “Once More with Feeling” tour, his first with the big band in five years, is firmly grounded in the grand Swing Era tradition. Severinsen’s band no longer is comprised largely of “Tonight Show” veterans, but he did have one ace up his sequined sleeve. Longtime band member and tenor saxophonist Ernie Watts was the go-to guy on many occasions during the two-hour concert, attended by 1,600. He was brought to the microphone on the swinging opener and seldom sat down long enough to warm his seat. But it was the big band that delivered the goods on such swingers as “Jumpin’ at the Woodside,” “Flying Home,” “Caravan,” “One O’Clock Jump” and “Sax Alley,” a furious tenor sax blowing contest between Watts and Chip McNeill. Amazingly, Severinsen proved that he still has the lip and the technique to play with power, precision and stamina, frequently stating the melodies and hitting the high notes on trumpet. He used a plunger-muted horn on “St. Louis Blues,” took the lead on “Georgia on My Mind,” and inserted some well-controlled trumpet blasts on “Here’s That Rainy Day,” which he announced as Johnny Carson’s favorite tune. Severinsen’s playing and bandleading certainly quashed any doubts that at 84 he might have lost some of his famous panache. 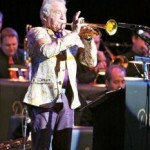 The ever vibrant GRAMMY-winning trumpeter and former Tonight Show band leader Doc Severinsen is back on tour – bringing His Big Band on the road for the first time in almost five years. Doc’s “Once More with Feeling” Big Band tour will be hitting the road this winter with concerts in Omaha NE (Feb 25), Manhattan KS (Feb 26), Lincoln NE (Feb 27), Brookings SD (Feb 28), Storm Lake IA (Feb 29) Cheyenne WY (Mar 2), Greeley CO (Mar 3) , Dallas TX (Mar 5), Edmond OK (Mar 8), Stillwater OK (Mar 9), Alma AR (Mar 10) and Springfield MO (Mar 11) with additional cities to be announced soon. Check back often for additional information.